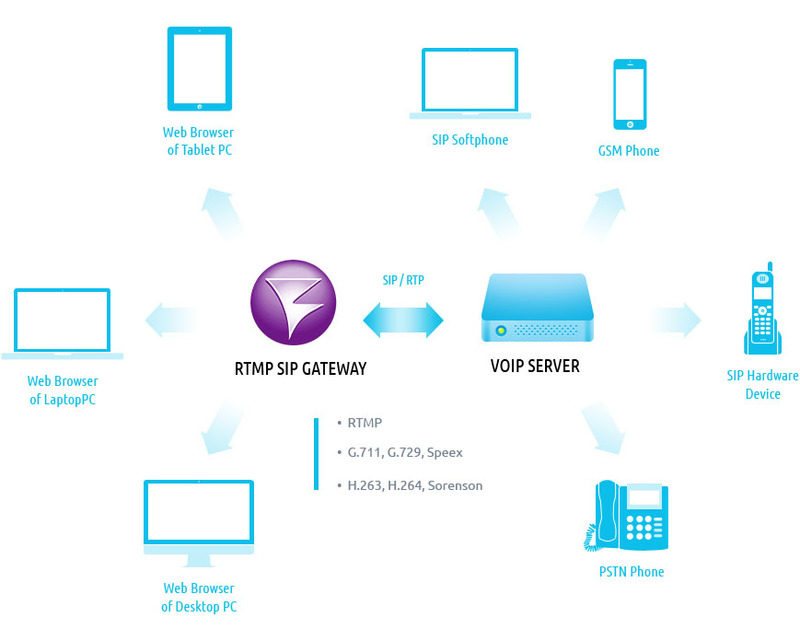 Flashphoner RTMP SIP Gateway is a solution based on Wowza Media Server and designed to integrate VOIP SIP environment with Adobe Flash Player or Adobe Air platforms. Tested with Asterisk, OpenSIPs, FreeSwitch, Cisco Call Manager, Bria, Xlite, e.t.c. In January 2014, we changed the licensing and pricing models for product Flashphoner RTMP SIP Gateway based on Wowza Media Server. Today the website flashphoner.com published new prices and licensing terms. For current prices you can link to the pricing page. Cost of license depends on the set of functions used and the maximum number of simultaneous calls. You can choose a suitable tariff option and complement the license with the necessary functions. Calculator will show the cost of the license. For example , the minimum license fee is 260 USD for 2 lines Flash -SIP audiocalls with Speex codecs and G.711. Such a proposal may be interesting for site owners who would like to place a click-to-call widget and use their own SIP-accounts to handle calls. With the grow of number of simultaneous calls and set of functions extension the solution cost increases. Maximum plan includes a limit for the 1024 simultaneous calls. This amount can be demanded at the major telecom operators and large-scale Internet services. Tariff plans for 128, 256, 512, 1024 lines are provided with the distribution of licenses for 2, 4, 8, 16 servers, accordingly. It can be useful when the audience of Internet service is geographically distributed and requires geo-balancing of load. Average tariff options for 8, 16, 32, 64 lines are suitable for click-to-call, and for medium-sized sites and services, which are planned to introduce browser-based audio and video calls within the service, as well as to external SIP/GSM phones for. Time of technical support increased. Tariff plans for Starter, Advanced, Enterprise-1, Enterprise-2 , Ultimate the following terms technical support included in the cost of the license are established: 3 months, 6 months, 9 months, 1 year, 1.5 years, accordingly. Pay special attention to the option 'Add SIP/RTP Broadcasting Feature'. In the absence of this option, all functions of audio and video calls are available in one-to-one model. For example one Flash to one SIP or one Flash to one Flash. Option 'Add SIP/RTP Broadcasting Feature' allows to to broadcast SIP/RTP streams received from SIP side across 2 and more Wowza clients. The broadcasting can be applicable to features 'Browser – SIP/GSM Speex, G.711 calls', 'Browser – SIP H.264 calls', 'Browser – SIP H.263 calls'. So at least one of these 3 features must be selected with the broadcasting. Selecting one of the features, you add posibility to broadcast corresponding audio or video stream. We believe that with the introduction of new licensing model, we could reduce the price threshold for Flashphoner RTMP SIP Gateway based on Wowa Media Server, and to adjust the value of the product according to the plans for its further development. Flashphoner is pleased to inform you that Flashphoner RTMP SIP Gateway supports Wowza Streaming Engine aka Wowza4. share SIP/RTP streams across all Wowza4 clients such as Flash clients, HTML5 and other client endpoints and devices. Flashphoner RSGW ensures two way streaming. For example, you can forward a stream received from Flash to an established SIP session. Flashphoner RSGW is also compatible with previous Wowza2 and Wowza3 versions. I'm attempting to trial flash phoner with WowzaStreamingEngine, but it seems the installer is designed to work with WowzaMediaServer only. I'm hacking my way through your installer script to get it to work (so far I've managed to install the server but not the test client) but this is kind of a pain. Have you got an install script available for WowzaStreamingEngine? It works either for Wowza3 and Wowza4. Please contact our support team to get Wowza4 builds if the builds are not available on the website. We will share the Wowza4 compatible builds soon. Note, if you are using Wowza developer license, it has a restriction on number of streams. It is a cause of "one way audio" issues. Please use trial license or other appropriate license to test it without issues.